Conquest, a family-owned business in Shepparton, Victoria, has brought out the 180DK-4 hydraulic ride-on sweeper ¬— a machine built on the same chassis as the superseded PB170 but with improved styling and ergonomics. 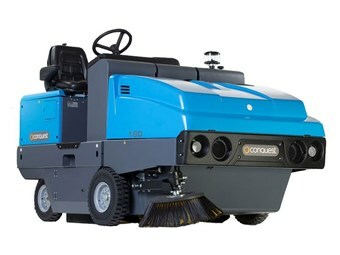 The Conquest 180DK-4 hydraulic ride-on sweeper. Built to be robust and reliable, the 180DK-4 has a redesigned front end, bonnet and bumpers. Receptacles are in place for a full lights kit which can be ordered as an additional option. Under the bonnet there is a Kubota engine in both diesel and LPG configurations. "The engine is liquid cooled through an oversized radiator which has been designed for the heavy applications that these sweepers are prone to operate in," Conquest says. "Wide-spaced fins allow dust to pass through the radiator rather than block the airflow which keeps the engine operating at the correct temperatures." The four-wheeled 180DK-4 features two rear wheels that drive and steer, which the company says is a vast improvement from the one wheel on previous models, "giving the machine greater stability and traction while delivering a smoother ride and reducing stress on the rear drivetrain". Sweeping width with the main broom is 1.2m; adding side brooms takes the sweep path to 1.8m wide.